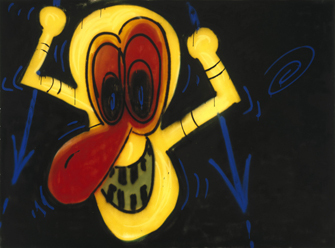 Graffiti Basics features a selection of eleven paintings from the widely praised Graffiti exhibition that was on view at the Brooklyn Museum from June 30 to September 3, 2006. Like the larger show, this smaller edition explores how a genre that began as a form of subversive public communication moved away from the street and into public and private collections. Modern graffiti, which is associated with hip-hop culture and spans many racial and economic groups, began in the mid- to late 1960s as a form of activist expression and as a way for street gangs to mark their territory. By the early 1970s, it had made its way to New York City and quickly become a phenomenon. Urban youth used the sides of subway trains and buildings as their canvases, reclaiming segments of their neighborhoods by “tagging” them with stylized renditions of their names or the names of the groups they formed. Later, graffiti artists began to paint on canvas or large sheets of paper, attracting the attention of art dealers and collectors. One of the first dealers to collect graffiti was Sidney Janis. His heirs Carroll and Conrad Janis donated almost fifty works from his estate to the Brooklyn Museum in l999. Drawn from this gift, the exhibition includes eleven large-scale works from such artists as Michael Tracy (“Tracy 168”), Kwame Monroe (“Bear 167”), Melvin Samuels, Jr. (“NOC 167”), and Sandra Fabara (“Lady Pink”). The exhibition celebrates the first citywide VH1 Hip Hop Honors Week, which begins Thursday, October 12, with related events and exhibitions throughout all five boroughs, and ends with “Hip Hop Honors” Day on October 17, when Ice-T hosts the broadcast on VH1 of the third annual VH1 Hip Hop Honors program. Graffiti Basics is organized by Charlotta Kotik, John and Barbara Vogelstein Curator of Contemporary Art, Brooklyn Museum. In association with Harry N. Abrams, Inc. and the release of their new publication Graffiti Women: Street Art from Five Continents, the Brooklyn Museum hosted a panel discussion on women’s contributions to graffiti and street art on November 18, 2006. Panelists included Lady Pink, Toofly, Swoon, and Lady K Fever. Artist Crash started spray-painting murals on the sides of subway cars, on basketball courts, and on building walls more than twenty years ago. Hear him discuss his work in the Brooklyn Museum exhibition Graffiti. This audio file is from a live recording of our Target First Saturday event on July 1, 2006. Exhibiting artist Lady Pink gives a talk in the Graffiti exhibition gallery. This audio file is from a live recording of our teen program held at the Museum on July 22, 2006. Brooklyn artist Ellis Gallagher, a.k.a. ©Ellis G., speaks about the history of graffiti, in conjunction with the Brooklyn Museum exhibition Graffiti. This audio file is from a live recording of our Target First Saturday event on July 1, 2006.